I rarely think of things and people as only existing in the present. Time is always sliding backwards and forwards for me. I think of things and people the way they were, and are, and imagine how they might someday be. There was a time when I tended to only look backward—sentimental nostalgia I think that’s called. I completely understood Brian Wilson’s song “I Just Wasn’t Made for These Times.” But, from the wisdom acquired from aging, I do understand now that I was made for the past, and the present, and the future. All of it. And that allows me to remain pretty calm and collected about where I, and all of you too, are headed. I believe that it’s gonna be okay. Being sappily nostalgic for an idealized past that you wish could last forever is no way to live. But I see nothing wrong with walking daily with “the love that remains,” the “saudade,” for the people and for the places and for the memories that have constructed our existence. Simple things get me to thinking about where we’ve been and where we’re heading. Here’s an essay I wrote back in October of 2012 for the Lawrence County Press. Again, thanks for visiting with me, and I hope you see fit to come back again. Is there anything in particular that fires your imagination, gets you to wondering, gets you to thinking, gets you to asking questions, gets you wanting to dig for some answers? I guess I probably have too many of those things. I have a sister-in-law who, on Facebook, is always telling me I need to get a life. If you’re on my side, there’s no need in getting angry with her; she’s telling me that in good-hearted jest, mostly. built that fence, and it looks just like it did the day they put it up…40 years ago. There is another section of fence behind my house that was strung up by mostly using available trees that were close to the property line. 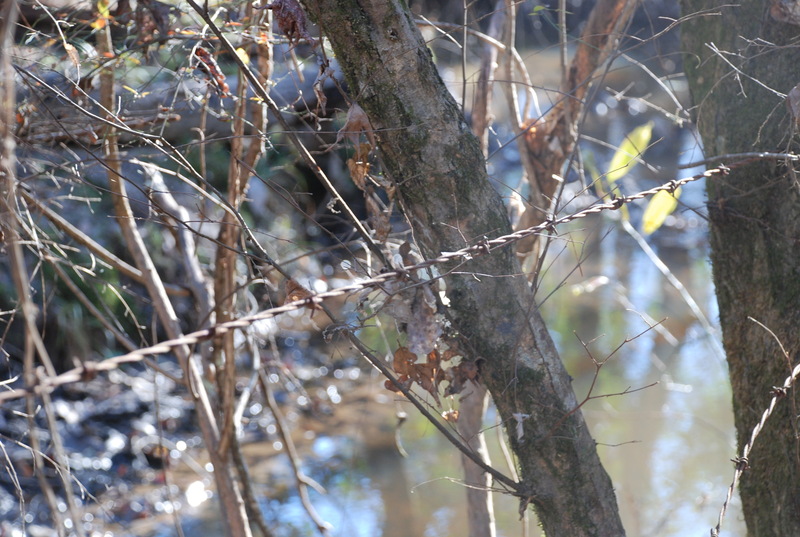 Today, some of that barbed wire comes out of the center of really large oaks and sweet gums that were obviously just small trees the day the wire was strung. I wonder who it was who strung that fence and when they did it. The wire has a different look to it than what you can buy today. That fence could easily be 50, 60, or 70 years old. Twenty years from now it will look about the same as it does today. Its only nemesis is falling trees and falling limbs. At the end of a fenceline that runs on a property boundary, often I find a metal stake that has been driven into the ground; sometimes I find two of them. Some surveyor hammered that steel rod into the ground decades ago. In the place where I live, it was well more than a half century ago. If there are two stakes, then two surveyors from different eras in time have done their work in that very spot. Nim Branch–or is it Madison? Another thing that fires my imagination, my wonderment is old maps and old documents. 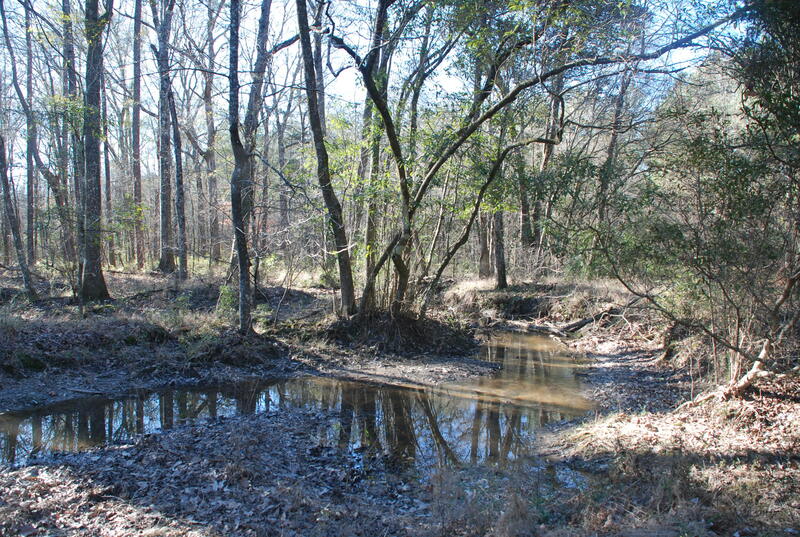 On one part of our land, the property boundary is a small branch or stream. My father always called this little stream “Madison Branch.” Other people, including my “Uncle” Tom Garrett called it “Nim Branch.” I never found anyone who could tell me why he called it what he called it. I once found it on an old map at the courthouse, and the stream was labeled “Nim Branch.” When I found that I knew that I had the final word. However—did you know there was going to be a however?—later I was looking at property ownership documents, and found that a man named—you wanna guess?—Nim Madison once owned the property. Two names for the branch had come down through time: the first and last name of a one-time owner of the property. Another thing that gets me to thinking is graffiti. Now, as you’ve probably guessed, not just any old graffiti strikes my imagination. As someone who once worked in schools, I despised graffiti and eliminated quite a bit of it in my time. I couldn’t stand it when children scrawled on books or walls or desks; ugggh, I just couldn’t stand it. So, it’s ironic I guess when I revere some graffiti, the good graffiti. What is good graffiti? It’s the graffiti that has stood the test of time, the scribble that has lasted. The other day I was at the Lawrence County courthouse, and I took a pretty hard look at something I had seen before. On the front side of the courthouse and around the corners, from one end to the other, there is graffiti. 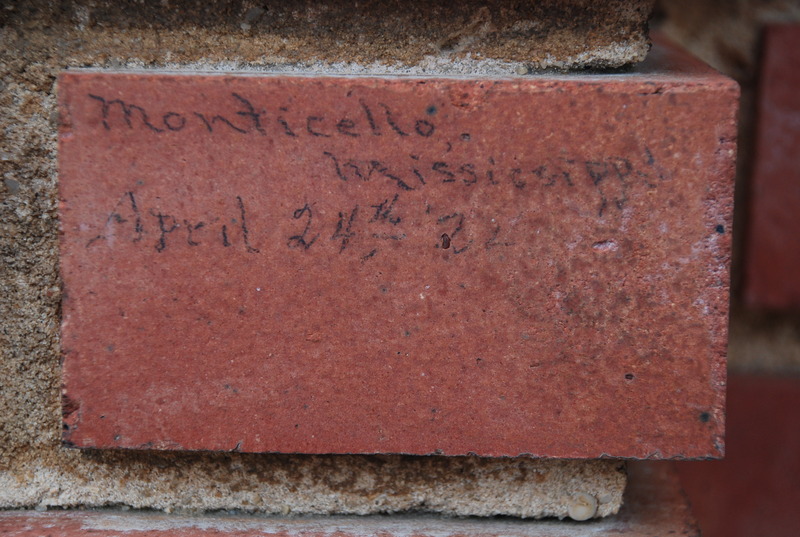 At about five feet high, people have written on the bricks. Now, I guess we should all be outraged, but much of this writing appears to be in an “old hand,” an old style of writing. I saw a few names, lots of numbers and figuring, and I think I saw a date…and I think that date was 1929. I’ll have to go back to the courthouse with more time to spare and my good camera and do some serious investigation. But if that writing is what I think it is, really old, then that’s good graffiti; it has stood the test of time. My Grandfather Davis once cut his name into a big old beech tree. I need to go back there to see if it is still readable. It was for at least 20-plus years I know. And on a door on the inside of the old train depot is written “G.B.R./ October 13, 1934/ Saturday.” The writer was 24 years old at the time he carefully wrote his initials on that door. I knew him as an old man. I wonder if he thought that what he wrote in 1934 would be there throughout the rest of his earthly life and beyond. I do wonder. Thanks much, Sharon. And I love to get wheels spinning!!!!! Yes! The writings on the courthouse wall definitely has my attention. Human behavior is fascinating to me, why we do what we do……makes ya wonder. Thanks Tony, for sharing your soul. 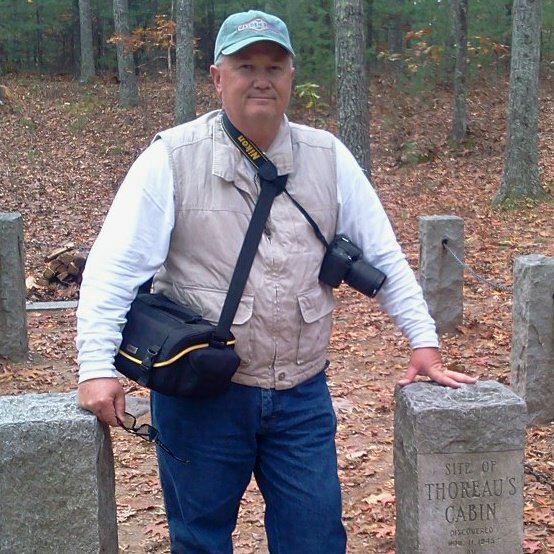 I really enjoy your writings I live in BRookhaven and was originally from Ruth. My g r and mother was a Rutland from Jayess. Venna, thank you so very much. Please come back and visit the site again. There are huge banyan trees here in Guantánamo Bay—some as big as a 3 storey house—and they are full of graffiti carvings. Some goes back to the late 50s, when the gates were still open here. I wonder if those people are still alive, and how they would be shocked to see that this place has, in many ways, remained the same? Love your blog, look forward to reading more! Thank you, LSL, for adding to the discussion, and especially for visiting and reading. Means a lot to me.